Your credit score has more impact on your everyday life than you may think. Not only is it what lenders look at to determine your credit health for interest rates – it can impact your ability to get a new apartment, a cell phone contract with no down payment, and in some states, even your opportunity to get a job. Somewhere along the line, you’ve probably heard that a 700 credit score is a good standard of the division between a Good credit score and a bad one. But is this true? There’s certainly some truth to that. FICO is the standard for credit scores, with each credit score agency having their own, at times slightly different, scoring models. FICO Scores range from 300 to 850. The higher the score, the better you look to potential lenders. 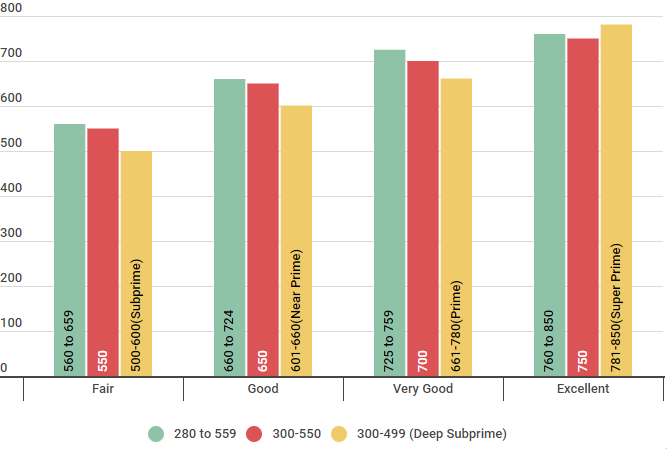 So, generally speaking, a 700 score is good — but, we’ll dive deeper than that. As you can see from the chart below, the average American is struggling to get over that 700 score hurdle. If you’re like most Americans and are looking for ways to earn a credit score over 700, keep reading. We’ll dive into whether or not that’s really a good score, what a 700 score can get you, how it’s derived and what you can do to achieve it. In order to understand if 700 is a good credit score, it’s important to realize that there are two main scoring models used by the three credit bureaus (Equifax, TransUnion, and Experian). These two models are the FICO Score, created by a separate entity, and the VantageScore which was created by the three credit bureaus. 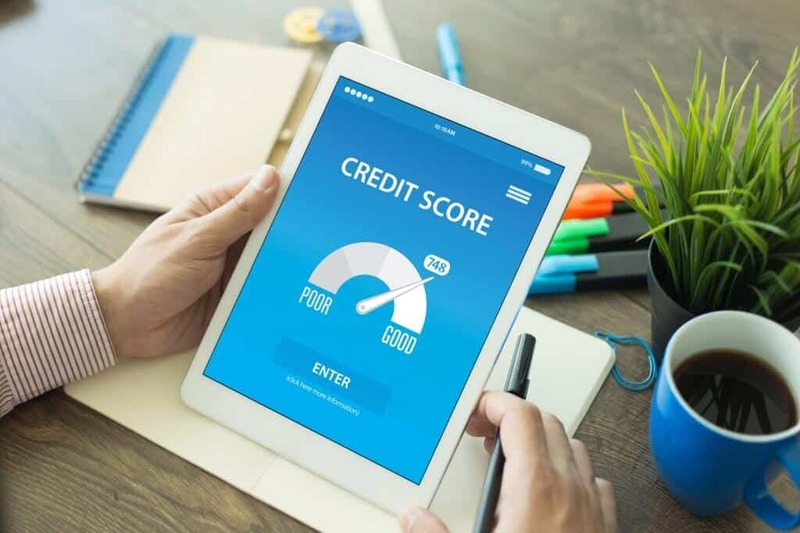 Although VantageScore and FICO calculate your score and then each credit bureau offers different versions of these scores, it’s really up to the specific lender to determine what thresholds they consider to be Fair, Good, Excellent, etc. 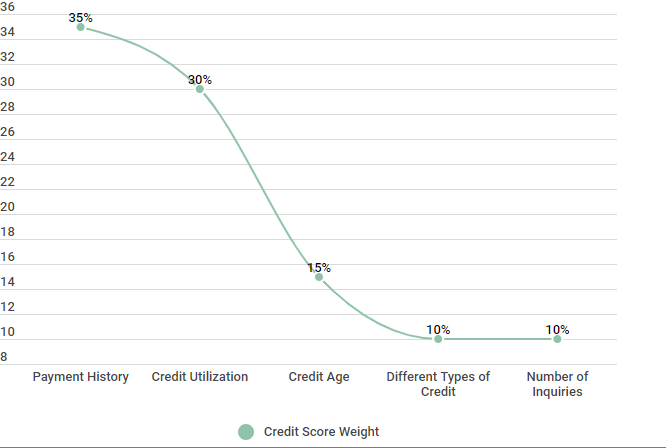 The chart below shows what is generally considered to be the standard breakdown of score ranges using the FICO credit scoring model as a guideline. As you can see, a 700 credit score is typically considered Good. Why is Having a 700 Credit Score Important? Having a Good credit score can mean all the difference when applying for credit. Below is an example of how important your score is when purchasing a home. Two homebuyers want a $200,000 mortgage and both earn $55,000 a year. Buyer A has a 700 credit score and is approved for a 30-year loan with a 3.75 percent interest rate. Buyer B has a 745 credit score and gets the same loan at 3.25 percent instead. A half percent may not seem like much, but it’s a costly fraction. Buyer A will have a monthly payment of $926 (not including property taxes or homeowner’s insurance). The total interest paid after 30 years will be about $133,000. Buyer B, on the other hand, pays just $870 per month, not including property taxes or homeowner’s insurance, and after 30 years will have paid only $113,000 in interest. That half percent cost Buyer A $20,000, underscoring the value of a higher credit score. No one wants to spend money they don’t need to. This is just one reason why having a better credit score can help you, not only immediately, but in the future as well. Let’s first look at what is considered a Good credit score within the two different scoring models. 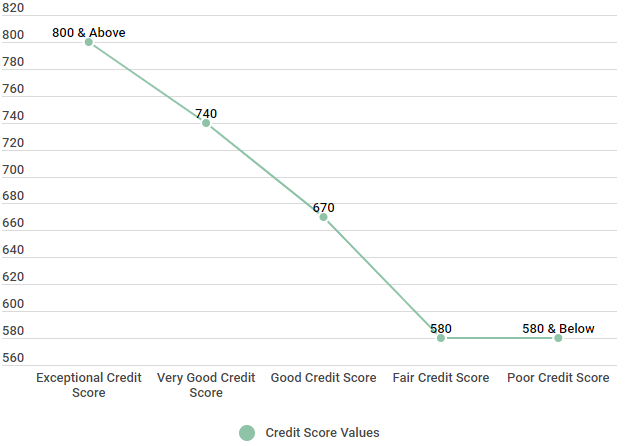 As you can see in the chart below, a Good credit score under the VantageScore model (typically used by TransUnion and Equifax) falls between 700 and 749. Similarly, a good credit score under the FICO Score model falls between 670 and 739. Source: By these guidelines, yes —a 700 score would be considered a Good score. Is 700 a Good Score for Equifax, TransUnion, and Experian? As you know, there are three major credit bureaus: Equifax, TransUnion, and Experian. But did you know that there are different ways to calculate your credit score? FICO scores are the most commonly known, but VantageScore has their own formula for calculating your scores. For that reason, you may find that you have different credit scores — even from the same credit bureau. Below is a quick breakdown of the credit score range for each of the three bureaus. You’ll notice that each has a different range for what is considered Poor, Fair, Good, etc. Source: Data found October 3, 2018. Experian Information Systems website. Credit Score FAQs. Retrieved from https://www.experian.com/blogs/ask-experian/credit-education/faqs/credit-score-faqs, Equifax website. Equifax Credit Score Range ™ US Only. 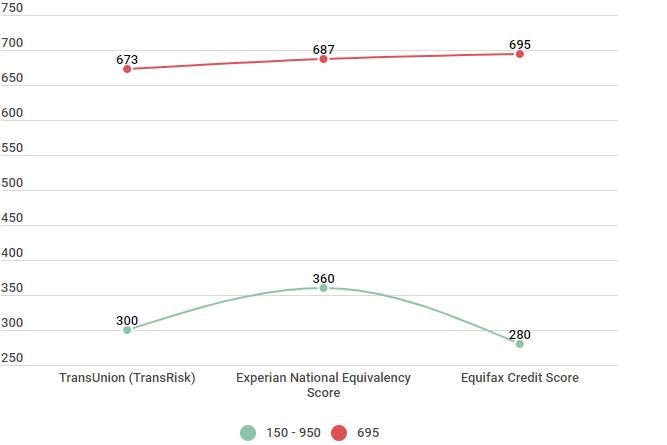 Retrieved from https://help.equifax.com/s/article/Equifax-Credit-Score-ranges-US-only, TransUnion VantageScore 3.0 model. Under these ranges, a score of 700 would be considered Good for Experian, but it’s only considered Fair for both TransUnion and Equifax. Now, let’s take a look at what a 700 credit score can actually get you —in real life. 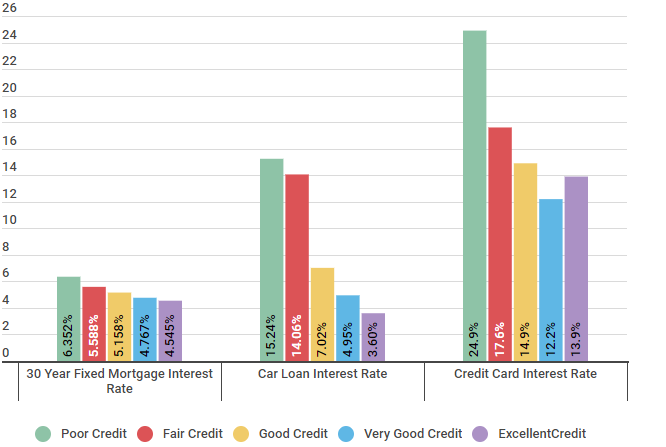 The chart below shows the different rates you might expect to get on various purchases with different credit scores. As you can see, it’s obvious that having a score lower than 700 can greatly increase the interest rates you’re charged, and as your score improves, the interest rates go down. If you are seeking to improve your credit, it is important to understand how your credit score is calculated. As you can see from the graph above, your payment history accounts for roughly 35 percent of your score, your credit utilization (your available credit vs. your balance) makes up about 30 percent of your score, the age of your credit makes up 15 percent, and the mixture of the credit accounts you hold and the number of credit inquiries you’ve had recently each account for roughly 10 percent of your score. Mastering some of these best practices can help you over the hurdle of achieving that good credit score of 700. Lastly, let’s look at some Sesame Data to see how long it really takes to get over that 700 score hurdle. The chart below shows us that when we sampled Credit Sesame members who were trying to improve their credit, it took them roughly 125 days to go from Fair credit to Good credit. Remember, Good credit is generally a score that falls between 700 and 749. Source: Surveyed 1,153 Credit Sesame members on 3/15/2018. Paul, a Credit Sesame member since 2014, has had a similar experience. He used Credit Sesame to monitor his credit scores and get recommendations for credit cards. As you can see from the chart below, Paul started with a 585 credit score in October 2015 and was able to achieve a 700 in February 2016. Seeing how all the actions he took impacted his score can be a great way to understand how various actions could improve your own credit score. Why Should You Learn What a Good Credit Score is? When you take the time to understand what a Good credit score is and ways to improve your own credit score, you’re taking a step in the right direction regarding your own financial health. In conclusion, yes —a credit score of 700 is a Good score. What’s more, having a Good credit score can help you get better interest rates, save on down payments, and overall have a better experience when applying for credit. Now that you know a 700 credit score is Good, what steps will you take to achieve it?